Sometimes, Federal Premium Ammunition, the contract operator of Lake City Army Ammunition Plant in Independence, Missouri, makes a little more ammo than the US military needs. 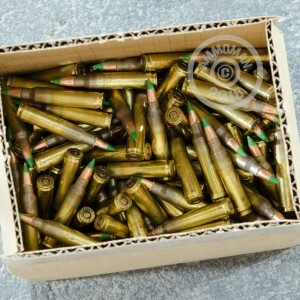 Instead of throwing it away, Federal sells this ammo to the public! AR-15 shooters love Lake City 5.56 NATO ammo for its consistent mil-spec quality. 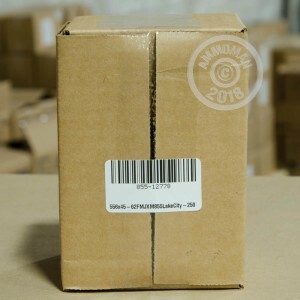 This 250-round box of M855 ball, the same kind used extensively by US forces in the war on terrorism, is an excellent way to get your hands on some affordable 5.56 NATO ammo. It uses 62 grain "green tip" full metal jacket bullets with light penetrating capabilities, so make sure you've got a good backstop. 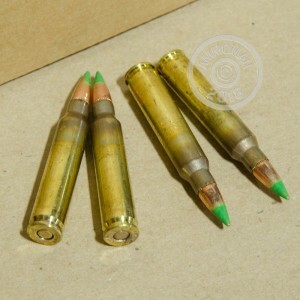 Like all Lake City ammo, these rounds use non-corrosive Boxer primers and reloadable brass cases. The case neck is left discolored to show that the annealing process has been completed. If you like what we've got for sale at AmmoMan.com, try buying over $99 worth of it in one order. Why? Because FREE shipping, that's why. No $10-$30 S&H charges waiting to ambush you at checkout means you pay only the list price.